The Indian selection committee on Monday announced India’s 15-man squad for the upcoming World Cup 2019 in England. The team will be led by Virat Kohli, with Rohit Sharma being the vice-captain. The team possesses great balance, with all the bases covered, and can be touted as a strong contender to lift the cup. While most of the players pick themselves, there was always a debate about India’s middle-order. None of the new batters had made the best use of their opportunities ahead of the tournament in England. However, the selectors have now invested faith in Vijay Shankar, who has been picked ahead of Ambati Rayudu for that all-important No. 4 slot. It is a brave call by the selectors to leave out Rayudu on the basis of his recent form with the bat. A few months back, he was assumed to be India’s No. 4 with the kind of form he showed in the series against New Zealand. However, his subsequent dismal run with the bat drew the curtains over his World Cup dream. At the same time, in whatever opportunities that he got with the bat, Shankar showed that he possesses the game that a team can rely upon for the No. 4 slot. The only thing going against the Tamil Nadu all-rounder is the lack of experience at the international level. He will have to rely upon his experience of nine ODI matches as he embarks on a dream of a lifetime - to represent India at the World Cup. Along with his batting at No. 4, Shankar is also a gun fielder and can always chip in with few overs of medium pace. The World Cup will take center-stage in England on May 30. India will feature in two practice games ahead of the tournament, and would like to get accustomed to the playing conditions. The entire nation would want Team India to repeat history and ensure that another World Cup comes home after a span of eight years. And Shankar could have a big role to play in that. 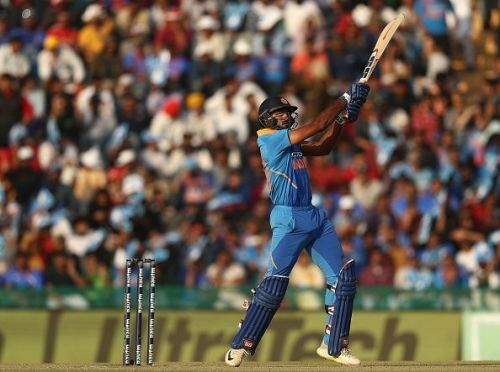 CWC 2019: Did Ambati Rayudu pay the price for India's late investment in Vijay Shankar? ICC World Cup 2019: Is Ambati Rayudu's exclusion from the World Cup squad justified?